Edward Said, the famous Palestinian intellectual, it turns out, was actually raised in Egypt. So, out goes his oft-repeated claim about the nasty Israelis expelling him from his "beautiful old house" in Jerusalem - he was living at the time in a luxurious apartment in Cairo. Said had long presented his own story as a symbol of the Palestinian tragedy; learning that he found himself in Jerusalem only to visit relatives while on vacation takes, shall we say, some of the edge off his story. Unexpected on its own, this dissimulation takes on additional meaning when it is seen as part of a pattern. At least two other very prominent Arabs born in Egypt, remarkably, have falsely claimed to be Palestinian. 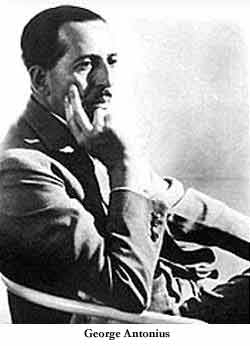 The first of them was the Edward Said of the 1930s - a Christian Arab who mastered Western ways so well and wrote a book so influential (The Arab Awakening, 1938) that he single-handedly changed European and American attitudes toward Arabs. His name was George Antonius and he was born in Alexandria in 1891 to a Greek Orthodox family of Lebanese origin. Like Said, he attended the most prestigious school of his home town and went off to the West for his higher education. In 1921 he settled in Jerusalem and became an administrator in the British Mandate for Palestine and, in the words of his biographer, "came to regard himself as a Palestinian" and "acquired Palestinian citizenship." On leaving British employ in 1930, Antonius demonstrated new loyalties by becoming informal advisor to Hajj Amin al-Husayni, mufti of Jerusalem and the Palestinians' political leader. At the all-important London Conference of 1939, Antonius served as a key member of the Palestinian delegation. In short, he abandoned his Egyptian-Lebanese identity to became Palestinian. In the words of Fouad Ajami, he gave "the struggle between Arab and Jew all his loyalty." On countless occasions, Yasir Arafat has regaled listeners about his Jerusalem birth and childhood. He fondly recalls his birthplace in a stone house abutting the Western Wall, then how he lived with his Uncle Sa'ud in Jerusalem. Like Said, Arafat presents himself as a victim of Zionism - someone who lost his wordly belongings and his place in the world due to Israel's coming into existence. But in fact, as two intrepid French biographers, Christophe Boltanski and Jihan El-Tahri revealed a few years, ago (in their 1997 book, Les sept vies de Yasser Arafat), "Mr. Palestine was born on the shores of the Nile." The French researchers tell an amusing story of discovery. They went to the University of Cairo and innocently asked for the registration of one Muhammad 'Abd ar-Ra'uf 'Arafat al-Qudwa al-Husayni at the School of Civil Engineering in 1956. This, Arafat's birth name means nothing to the Egyptian clerk, who "sits down behind a rickety wooden table, almost completely hidden by the pile of dusty files bound in black leather" and "blows off a layer of grime in a most professional way," then hands over the records. In a blue ink faded by time, the researchers find that their man, living at 24A Baron Empain Street, Heliopolis, "was born on August 4, 1929, in Cairo." With this information in hand, they dash over to the State Registry and find Arafat's actual birth certificate, which confirms the date and place. Arafat then lived in Cairo until the age of 28 and identified as an Egyptian. His first political affiliation was an Egyptian student organization closed to Palestinians. He fought for an Egyptian group against Israel in 1948-49 and subsequently served in the Egyptian military. He first traveled to Moscow, in 1968, on an Egyptian passport. Arafat all his life has spoken Arabic like an Egyptian, something that has sometimes impeded his career; on first encountering him in 1967, a biographer recounts, "West Bankers did not like his Egyptian accent and ways and found them alien." How is it that three men raised in Egypt decided at various points in the twentieth century - the 1920s, 1950s, 1970s - to become Palestinians? The answer probably lies in the fact that for a politically ambitious activist, Palestinian politics has far more to offer than Egypt's. An intellectual can raise his profile much higher; where would Said be today were he advocating Egyptian causes? And a politician finds the path to power far more open; had Arafat made Egypt his life's work, he might today be a retired deputy from that country's rubber-stamp parliament. Being Palestinian, in other words, is a good career move. 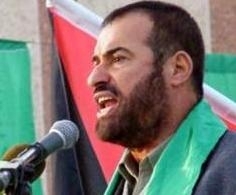 Fathi Hammad, the Hamas "minister of the interior and of national security." Is Egypt incapable of supplying fuel for 1.5 to 2 million people in the Gaza Strip? ... when we seek the help of our Arab brothers, we are not seeking their help in order to eat, to live, to drink, to dress, or to live a life of luxury. No. When we seek their help, it is in order to continue to wage Jihad. ... Allah be praised, we all have Arab roots, and every Palestinian, in Gaza and throughout Palestine, can prove his Arab roots - whether from Saudi Arabia, from Yemen, or anywhere. We have blood ties. So where is your affection and mercy? ... Personally, half my family is Egyptian. We are all like that. More than 30 families in the Gaza Strip are called Al-Masri ["The Egyptian"]. Brothers, half of the Palestinians are Egyptians and the other half are Saudis. Who are the Palestinians? We have many families called Al-Masri, whose roots are Egyptian. Egyptian! They may be from Alexandria, from Cairo, from Damietta, from the North, from Aswan, from Upper Egypt. We are Egyptians. We are Arabs. We are Muslims. We are a part of you. Allah Akbar. All praise to Allah. Allah Akbar. How can you keep silent, oh Muslims, when the people of Gaza are dying? You watch from the sidelines without providing them with the simplest thing, which you give to the West for the most meager price. Related Topics: History, Middle East patterns, Palestinians | Daniel Pipes receive the latest by email: subscribe to the free mef mailing list This text may be reposted or forwarded so long as it is presented as an integral whole with complete and accurate information provided about its author, date, place of publication, and original URL.